RICHMOND, Va.–Corporal Benjamin S. Kopp, a member of the 75th Army Ranger Regiment, saved six of his comrades when his unit came under small arms attack by insurgents in Afghanistan. Although mortally wounded, he saved four more lives back in the United States through his selfless gift of organ donation. To honor Corporal Kopp and all other brave soldiers who became organ, tissue and eye donors, a Fallen Soldier Donor Memorial is being dedicated in the National Donor Memorial at the United Network for Organ Sharing. It honors members of our military, both present and past, who have made organ and tissue donation their last courageous act of service so that others may live long and healthy lives in a free and safe world. The memorial has been nearly four years in the making. It was the idea of Gary Foxen, a lung recipient. Foxen met Corporal Kopp’s mother, Jill Stephenson, in 2011, when Kopp was honored as part of the annual Tournament of Roses Donate Life Float, an annual celebration of the gift of life also conceived by Foxen. The memorial is a gift from the OneLegacy Foundation, with additional support from Gary and Lois Foxen and a number of additional individual and corporate contributors. Ann Walsh, the memorial’s sculptor, said she wanted it to be “abstract and ethereal,” so she decided to make the statue hollow and see-through. “The lines echo the natural growth in the garden,” she added. 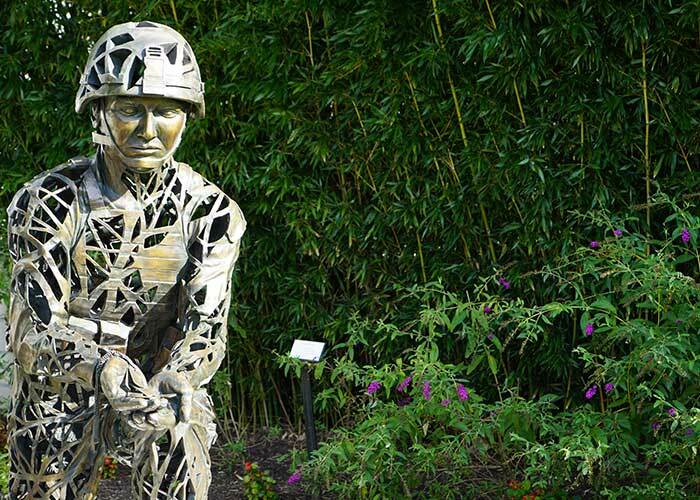 The Fallen Soldier Donor Memorial statue will be unveiled in a ceremony on November 10 at 9 a.m. ET at the United Network for Organ Sharing in Richmond, Va., as will a companion plaque that will hang at Landstuhl Military Hospital in Germany. Due to space constraints the ceremony is by invitation only. The public may watch the ceremony live on UNOS’ Facebook page. Speakers: Corporal Benjamin S. Kopp’s mother, Jill Stephenson; Virginia Governor Terry McAuliffe; UNOS CEO Brian Shepard; OneLegacy Foundation CEO Thomas Mone; Dr. Guenter Kirste from Landstuhl; and Lois Foxen. United Network for Organ Sharing a private, nonprofit organization, unites and supports the organ donation and transplantation community nationwide through organ placement, research, technology, policy development and education. UNOS serves as the nation’s Organ Procurement and Transplantation Network under federal contract. As the OPTN, it matches lifesaving organs with people awaiting transplants nationwide. As the largest organ, eye and tissue recovery organization in the world, OneLegacy serves more than 200 hospitals, 11 transplant centers, and a diverse population of nearly 20 million people throughout seven counties in Southern California.